Motherwell manager Stephen Robinson was particularly miffed by the manner of the first goal conceded by his side in Sunday's disappointing 3-0 defeat at a rampant Hibernian. 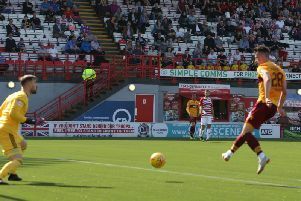 The Steelmen's gaffer was critical of referee Bobby Madden's decision to award a free-kick against Peter Hartley for a soft looking handball, with Hibs striker Stevie Mallan then scoring from the 20-yard deadball to send the Edinburgh team on their way to a deserved success in this Scottish Premiership season opener. Robbo said: “It’s a difficult one to take. “There were only a certain amount of defenders we could put on the pitch so we knew that we perhaps weren’t ready to play. “An incredible decision changes the course of the game. I’m not saying we lost the game because of that, but it certainly changes the course of the game. “To give a yellow card (to Hartley) for it being a deliberate handball when you’re turning your back on the ball and it hits your elbow – crazy decision – and it ends up having a big influence on the game no matter what way we dress it up. “We didn’t pass the ball well enough in the first half. “When we landed on it we had to be braver and second half we showed that we can do that. “Our decision making for the second goal was poor and we got punished for that. “And then you go and chase the game when you’re 3-0 down. Even at that we had a lot of chances. “Danny Johnson hits the post, he has two one on ones. “He has a goal disallowed for another deliberate handball. Some decisions obviously had a big influence on the game.